Yesterday Jeremiah Moss's Vanishing New York announced the imminent closure of a Times Square/Broadway institution: the Cafe Edison, in The Edison Hotel. Drop a bomb on Times Square. It's over. The Cafe Edison is being evicted. The last real coffee shop left in the neighborhood, it's an absolute oasis in an otherwise miserable part of town. Located in the Edison Hotel since 1980, it's also known as the Polish Tea Room, a place to get an affordable meal of matzoh ball soup, brisket, a bagel. It's long been a favorite hangout for the theater crowd, cops, blue-collar workers, even magicians. News spread like wildfire after Moss broke the story, & it was covered in the News, Post & Times. There's been an outpouring of sadness, indignation & support from the cafe's loyal customers, especially among the theater crowd. This morning, Broadway actor Martha Plimpton wrote a piece for the Daily News, saying, "Oh, my God, it’s a tragedy. 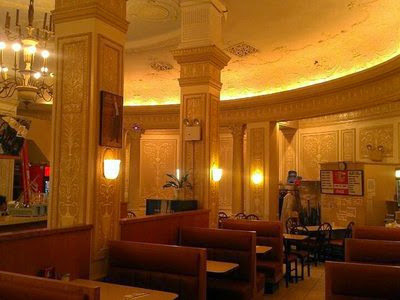 The Cafe Edison should be landmarked." And "There is absolutely nothing redeeming about the Times Square of today." Julie Klausner wrote a piece for Grub Street, saying, "this closing feels different: like the final dagger in the Times Square Tourist Elmo Massacre." A petition has been organized, to urge the hotel to keep its longstanding, historically significant tenant. You can sign it here. Almost four thousand people have done so already. And Jeremiah Moss has organized a Lunch Mob for tomorrow, starting at noon. Find out more here. Cafe Edison is at 228 W 47th, between Seventh & Eighth. Sign up or show up (or both!) to help give the cafe a chance to survive. Help keep a landmark of old city style & spirit around for years to come. We need it.